Did you see it? Were you worried about it? Did you duck or take shelter? What I'm talking about is the Armageddon-like headline I saw earlier this week: Mystery object to whizz by Earth Wednesday. Yikes! Are you kidding me? 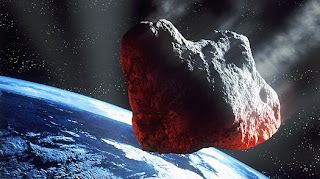 The story described a 33 to 50 foot object that was going to come within 80,000 miles of Earth. 33 to 50 feet? 80,000 miles? Okay, not exactly Armageddon. We can stop humming Leaving On A Jet Plane anytime soon. But the disturbing thing about this is scientists were unable to figure out what the heck this object was. Was it an asteroid? Piece of space junk? Iran's first nuclear missile? I've got a pretty good idea. In a related story this week it was reported that NASA was having problems with the space station's water recycler. 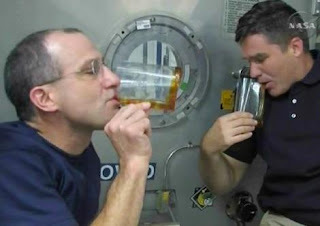 You know the thing that processes astronaut's urine into drinking water? It seems the urine was clogging up the recycler. Well, duh. And you know what? I think the NASA engineers got so frustrated they just pitched it. How else do you explain a headline about an object "whizzing" near Earth. Aw, c'mon. Didn't you see that one coming? You are what you drink! Blllleeeeccchhhh! What? Did they run out of Tang? Quirks: But it was just a wee problem. Me-Me: Don't let this leak out but yeah they haven't used Tang in decades. Those crazy water recyclers. They do that all of the time. Just when you want a drink of urine they break down on you. Don: Isn't it always so. Hey, are urine trouble still with that shower of yours? So in other words, we had a near miss with the space stations high tech porta potty?? Yikes!! Nipsy: Nah, I'm just messin' with ya. Hope you're not pissed with me. Funny!! Amazin'! All the stuff I find out in blogs!! 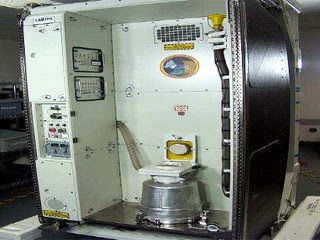 But I gotta say I'm very glad I'm not on the space station! KaLynn: Yeah, if the bathroom's out of commission, where you gonna go? CL: "space juice" - too much. Liquid gold, eh?